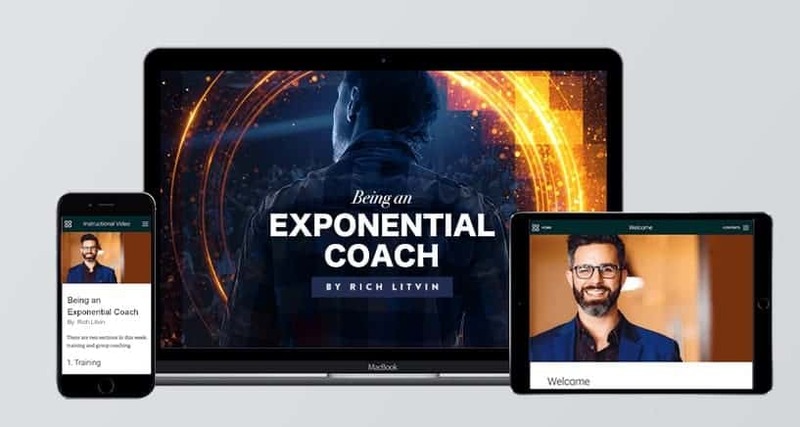 World-renowned and highly sought-after performance coach Rich Litvin invites you to deeply develop your highest coaching ability, so you can exponentially grow your income, impact, freedom and legacy as a coach. That’s the question screaming inside Rich Litvin’s head when he peered into his bank account one early morning. He had almost no money left in his account. For the past year, Rich had worked hard to build his skills as a coach. He had done training after training. He knew his coaching was powerful. Yet, the cold hard facts were hard to deny: he no money to show for it. So… why isn’t this working? Rich soon found the answer and solution to break out of that pattern. Before you find out what helped him turn the tables around, let’s turn the focus on you. Are YOU silently screaming inside? Wherever you are in your coaching journey, whatever you’re struggling with, know that just by being here, a brighter future lies before you. 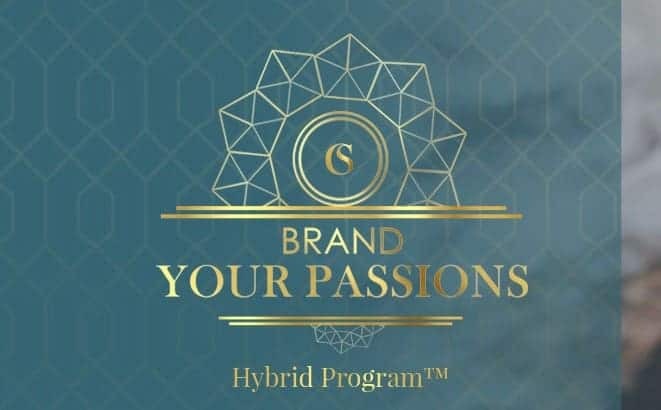 For you’ll soon have the solution to get past your blocks and propel your coaching business to exponential levels of success, impact, freedom and fulfillment. So how did Rich Litvin go from a struggling coach to one of the world’s most sought-after coaches? Rich Litvin was struggling as a coach on the brink of being broke. What happened next? Well, Rich found a way to get unstuck. But not only did he get unstuck -- he continued to advance from strength to strength as a coach, always upleveling himself to the next stage of growth and success. Rich went on to coach high-performing individuals, including influential leaders, Olympic athletes, Presidential candidates, Hollywood film directors, Special Forces operatives, serial entrepreneurs, and more. He also co-wrote a bestselling book on coaching, and founded and continues to lead several coaching communities with extraordinary consultants and coaches. What exactly did Rich Litvin discover to put him on the path of exponential growth as a coach? And how did he do it without stagnating, plateauing, or hitting an income glass ceiling -- and most importantly -- without burning out or compromising his freedom and desired lifestyle? Rich helped his clients lead an exponential LIFE. His own life and coaching business then grew exponentially as a natural result. An exponential LIFE is not just about achieving any goal. It’s going for that moonshot, that game changer. It’s achieving the impossible goal and dream. And when you can help your clients achieve THAT, they will want to work with you again and again. L - Legacy: Extraordinary high performers aren’t defined by money, success or fame. What really counts is the legacy and the difference they make in the world. How can you help your clients find the true legacy they want to be remembered for? I - Impact: How can you help your clients make their impact go deep or wide or both? How can they leave a bigger impact on this planet? F - Freedom: What freedom do they secretly crave and don’t speak of? How can you unleash it? E - Energy: How can you guide your clients to be on the path that energizes, fascinates and motivates them? When you lead your clients to discover their legacy, create an impact, experience freedom and align their life with what energizes them, then you’ve helped them create and live an exponential LIFE. Do you want to know exactly how you can do this for your clients? Well, you’re in luck because you’re about to discover the 8 Principles of Exponential Coaching which Rich uses to draw out the best performance out of anyone, so they’ll quickly experience the 4 components of an exponential LIFE. A mother of three came to Rich with a ‘crazy’ dream of convincing Sir Richard Branson to write the foreword to her book and become President of her organization. After he coached her, she managed to get Sir Richard Branson to agree to do both. And now she runs one of his companies, too. Rich’s client in the aerospace industry made a $1,000,000 as a result of a single coaching conversation with him. An author Rich coached was asked to speak at Google about his initiative around Corporate Social Responsibility. After this speech, one of the senior directors of Google joined his Board and he was invited to fly to Bangladesh for a private meeting with Muhammad Yunus, the Nobel Prize winner and developer of micro-financing. A fundraiser for a nonprofit, after being coached by Rich, just received his first backing from a Hollywood star and is now in conversation with one of the wealthiest philanthropists in the world about her becoming a million dollar donor. A mother of two boys and the founder of a UK charity is one of Rich’s clients. She has the backing of a host of famous and powerful people and was awarded ‘Campaigner of the Year’ by the British Prime Minister. She has worked with Rich to build massive confidence and take her vision to a worldwide audience. Maybe you’re thinking there’s just something special about Rich. That only Rich has some kind of talent to get this kind of results for his clients.Well, let us assure you this exponential coaching ability is not something only Rich Litvin has. You see, Rich has taught these 8 Principles of Exponential Coaching to other coaches. Time and time again, the coaches who apply the 8 Principles of Exponential Coaching create exponential results for their clients, which results in growing their coaching business exponentially too! A woman Rich helped transition from the corporate world to becoming a consultant was offered her first ever contract with a top Hollywood studio at $350,000 for 6 months of consulting – it was her very first gig after leaving the corporate world. One of Rich’s clients is a coach who signed her second ever paying client for $160,000. Her client paid in full and in advance. Terrance created $250,000 in the first five months working together with Rich. He has had signed on clients paying him $100,000 and his practice is full. He achieved this with no website, email list or business card! Christina went from making $50,000 in her first 2 years as a coach, to making $449,000 in her first 2 years working with Rich. Tony now coaches just 2 days a week and makes $250,000 a year. YES — you too can create powerful results for extraordinary clients. YES — you too can escalate your impact, income and freedom. YES — you too can become an exponential coach. All you need to start on the path of exponential coaching are these 8 Principles of Exponential Coaching. Are you ready? Then let’s get to know a little bit more about the coach who will bring out the exponential coach in you. Rich Litvin runs a leadership consultancy for world leaders, based in Los Angeles and London. The methodology is deep coaching. Bespoke. Not time-based. Ultra-successful people – people you would assume don’t need a coach – are the ones who call Rich. His clients include Olympic athletes, Presidential candidates, Hollywood film directors, Special Forces operatives and serial entrepreneurs. He is an expert at taking high-achievers to the greatest levels of success. A lifelong student of human behavior, he has extensively researched the question of how tiny changes can account for radical differences in performance. A thought leader in the coaching world, Rich is the founder of 4PC – The Four Percent Club – a private club for the top 4% of the world’s most extraordinary consultants and coaches. Rich is also the founder of The Confident Woman’s Salon and The High-Achieving Introvert Project. He is a member of the Association of Transformational Leaders. His forthcoming book is The Problem with Millionaires: A Book of Provocative Questions for Top Performers. You see, the challenge facing high achievers is that their game is so much bigger than that of anyone around them. They play at a level at which most people cannot even see how much they are holding back from what is possible. And what helped you get to your current level of success is precisely what will hold you back from your next level of success. A scientist by training, he has a background in Behavioral Physiology and Psychology. He trained to teach at the University of Oxford and he has a master’s degree in Educational Effectiveness. Rich has lived and worked in eight countries and on four continents. His wife, Monique, is an award-winning singer/songwriter. They are the proud parents of two little boys. And he still gets nervous walking into a party. 01You’ll become an Exponential Coach and deeply transform lives. 02You’ll experience deep, lasting, natural confidence -- from the inside out. This course is not just informational. It’s transformational. After applying everything you’ve learned in this course, you’ll develop a deep, natural confidence in yourself from the inside out. You’ll move past self-doubt, fears and insecurities holding you back from the next level of success. 03You’ll achieve powerful shifts for your clients in less time. You’ll learn how to go beyond surface coaching and into deep coaching. This is where the magic really happens. This is where you help your clients see the world differently, and when they do, they world transforms. That’s when powerful shifts happen, and they happen quickly. 04You can create a thriving practice with high-end clients. You're not just the average coach. You'll be the coach that top performing leaders, entrepreneurs and extraordinary people line up to work with again and again. Why? Because when you consistently draw out the best performance from your clients to achieve the impossible goal, they’ll keep coming back to you and they’ll recommend you to the people they know. 05You’ll enjoy greater income without burning out. When you grow your business through more re-enrollments and recommendations, you’ll spend less time and money on marketing. This means greater income without needing to spend more time hustling for clients, and without getting caught in the vicious cycle of exchanging hours for dollars. 06 Unlock the freedom to live an exponential life. When you create greater impact and income from your coaching practice, you gift yourself the freedom to live an exponential life. Spend more time with your loved ones. Strike off your bucket list. Create more impact through philanthropic works. And passionately pursue every other way your heart and soul want to soar.. Learn how to design an environment of being with the right people who understands you and raises the bar for you. As you reach the completion of the program, you’ll look into how you can apply the insights into action so you can build an exponential coaching practice. Rich is a world-class coach and one of the most naturally confident people I know. If you’re ready to make a real and tangible difference in your life I highly recommend you work with Rich. Rich is a man of deep authenticity, passion & courage. He is also one of the most skilled & intuitive coaches around. I strongly recommend Rich to anyone looking to take their lives to the next level. Rich is THE man to coach you if you are looking to be more authentically successful, do less, achieve more, be happier and be your most amazing self. I was a member of The Confident Woman’s Salon and a one-on-one client and I created over $75,000 as a direct result of working with Rich. When I met Rich, I had a full client load and I was also running group programs. But I was still doing $150/hour sessions and getting burned out. I was so good at launching people into the lives of their dreams but I didn’t have a dream life myself, as I was working all the time. I was even considering leaving the coaching field. Now 90% of my clients are on a contract; my fees have quadruped and I almost doubled my coaching income in the last year. I now have a lifestyle that includes travel and time off. And I am creating my practice to be as fun for me as it is powerful for my clients. Rich has a combination of inside-out and outside-in coaching that creates results. Some coaches just focus on external goals and others just on beliefs. We need both if we are to be truly successful at anything. "The two years before Rich, I made $50,000 combined. The two years since hiring Rich – $449,000." Christina started as a struggling coach who became an Evercoach Tribe member, then she became a member of one of Rich’s coaching Salons, then he invited her to become an Evercoach Ambassador, then she became one of his private clients and finally she was accepted as a founder member of 4PC. What is the value of a legacy? The world is full of extraordinary people with the potential to be exponential. They are craving to reach their full performance, to get to the next level, to create more impact. As a coach, you are the missing link they need to get them from where they are to where they want to be. In fact, you’ve got what it takes to bring them even further than where they want to be. You can help them get to where they never even dreamt they could be. You can help them achieve the impossible dream. Then you’ve built a powerful legacy. What is the value of a leaving behind such an important legacy? What is the value of fulfilling your higher purpose? What is the value of the freedom and income which you can create for yourself by building this legacy? Thousands of dollars? Hundreds of thousands? Perhaps even more. You and I both know in actuality how priceless this is, but we still need to put some figure to it. So let’s get to business and start talking numbers. To get one-on-one Deep Coaching from Rich Litvin requires a minimum investment of $10,000. That’s the minimum. Many clients have paid him $200,000 or more. Today, you have the chance to learn the 8 Principles of Exponential Coaching which Rich has developed over 10 years of research, learning and deep coaching. Principles he has used to coach extraordinary clients, charge premium rates, and create powerful results. More impact. More income. More freedom. The best part? You don’t need to invest $200,000 which many clients have paid Rich for. You don’t even pay the Rich’s minimum fee of $10,000. In fact, not even $1,000. “Being an Exponential Coach” is packaged at an insanely low price of $695. But if you commit today, you can learn to become an exponential coach with Rich at a deeply discounted price of just $695 $445. And as if that’s not enough value, check out these priceless bonuses you’re getting with “Being and Exponential Coach”. 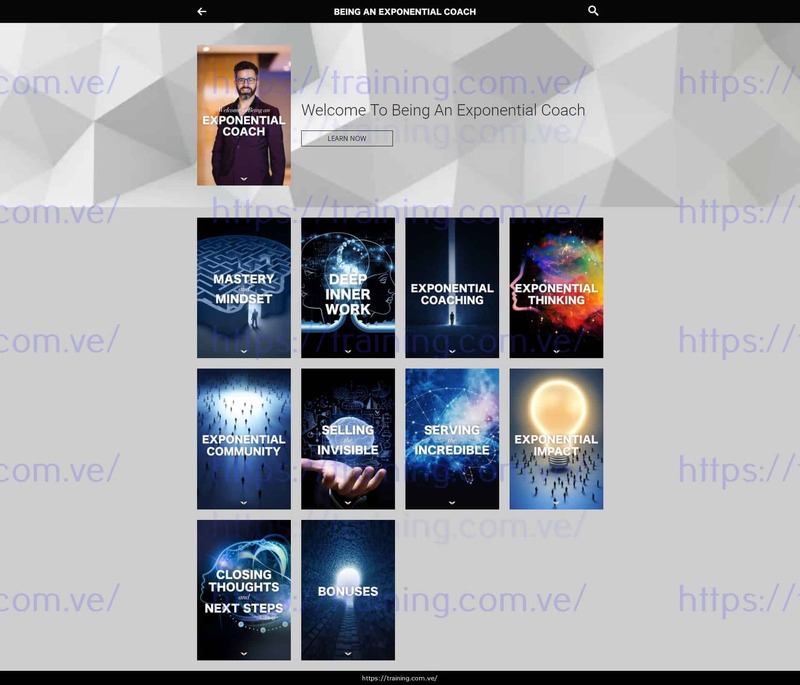 You’ll also get these exclusive bonuses to unleash your exponential coaching skills! You’ll have access to 4 Deep Coaching Masterclasses with Rich Litvin where you’ll experience the action of applying the 8 principles of Deep Coaching. Being an exponential coach is an ability to get comfortable being uncomfortable. In this bonus module, you’ll learn 25 powerful paradoxes which pushes you -- and those you coach -- to the edge of your comfort zone where accelerated growth takes off. Discover the A-Z of coaching -- 26 Deep Coaching secrets developed from over a decade of researching, learning and deep coaching. How is “Being an Exponential Coach” different to other coaching programs? To powerfully coach extraordinary people, leaders and entrepreneurs, you need to help them go deeper than ever before. And you can only help them go as deep as you’ve gone yourself. That’s why this course is designed to be transformational, not just informational. When you go through the videos and reflect upon the lessons, you’ll open the doors to where deep transformation happens. 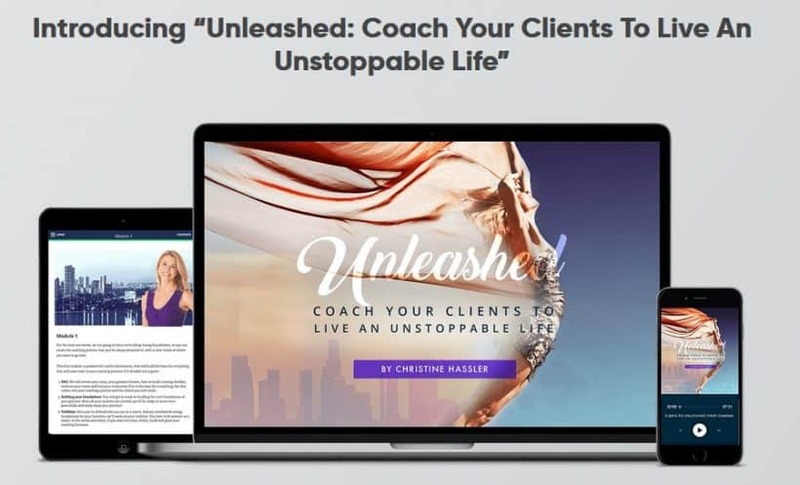 When you learn these principles and secrets, you’ll unleash your highest ability as a coach to create high-quality powerful results and impact for your clients. And they will want to work with you again and again. And they will recommend you to others. Elevate your own life so you can create an exponential coaching practice. This course is different because it focuses on giving you insights which elevate your own life, so you can develop the skills to transform others in the same way. We already know, if we develop ourselves, we develop as coaches. We develop as business owners. Get ready to become exponential! You will be blown away by the sheer quality and wisdom packed into every lesson which guides you through the 8 Principles of Exponential Coaching to become an Exponential Coach. Even the packaging and online membership area have been designed with the greatest care. Upon implementing the exercises and insights packed into “Being an Exponential Coach” in your practice, you’ll notice an instant result in your mindshift, confidence, and ability to coach to create powerful results with more ease and joy. You will have the skills and confidence to coach anyone at any stage of life to achieve significant breakthroughs and lasting impact. Remember you can also write to us anytime for personal guidance and tips. “Being an Exponential Coach” will empower you to become a phenomenal coach with the ability to create deep and lasting impact. Becoming a better coach will also elevate YOUR life forever because your business will grow naturally as a consequence. You’ll enjoy the lifestyle you’ve always dreamed of, have more time for your other personal goals, and enjoy more happiness and impact in all areas of your life. Nothing great has ever been achieved without taking action. If you change nothing, where do you think you’ll be 12 months from now? 5 years from now? 10 years from now? Same frustrations? Still struggling to find extraordinary clients? Burning out from working at rates below your worth? If you take action now to become an exponential coach, you can rewrite your future. You can rise up to become an exceptional coach extraordinary people want to work with again and again. You can live an exponential life with the income, freedom and fulfillment you truly deserve. “My life and my impact have improved dramatically. I have become much clearer about how I work and how profoundly it changes my clients’ lives. By communicating more powerfully and delivering more value, I have proposed—and had accepted—strong five-figure fees that just a few short years or even months ago would have seemed impossible to me. And my income has sky-rocketed. Not only that, but the results I have created feel entirely effortless, and I am now working only with extraordinary clients who inspire me with their bold vision for their lives. In addition to that, this year I have met one of my heroes—something that also seemed impossible to me a few months ago. And I am now launching The Extraordinary People Project, which has me excited about what is to come and the impact that I can make in the world. Sometimes I have to pinch myself to realize what I have achieved and to see that it is real. “It has been a pleasure and a joy working with Rich. I feel like the ugly duckling who turned into a beautiful swan. I now live in possibility and wonder, less afraid of criticism, no longer afraid of the word “No”. Rich has helped me to focus on what I really want and then go out and create it. He is gentle when I need it and challenging when I don’t know I need it! Both to great effect. Rich, you have helped me think differently and reach for the stars.